The hard work begins now and his future is in his hands. 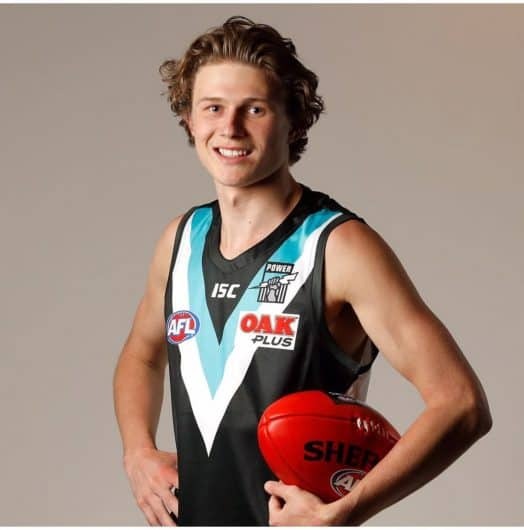 FOSTER’S Xavier Duursma’s dreams came true last Thursday when he was drafted by the Port Adelaide Football Club with pick 18 in the National Draft. The Foster junior, the son of Dean and Susie has long been touted, as a potential league footballer and it didn’t take long for it to sink in as he was off to Adelaide by Sunday. He presented at the club at 7.00 a.m. on Monday for a medical screening, breakfast and an introduction to all the players before the main session at 9.00 a.m. The 18 year-old captained Gippsland Power in the TAC Cup this season and he can’t wait to get stuck into pre season training and get amongst his new team-mates. Power coach Ken Hinkley said Duursma has “an outstanding future”. Xavier, who was also school captain at Foster Secondary College completed his VCE last week and has managed to juggle a very busy couple of years in his pursuit of playing league football. He had been spoken to by all clubs in the competition except North Melbourne, who didn’t have a pick early enough to take him, and was fully prepared to go and play interstate when his name was called out by Port Adelaide. Xavier is the first Foster junior to be drafted onto a main list, but there have been others Rookie listed players in the past. He is the second player to be drafted by Port, former Foster player Brett Eddy also played with the Power during the 2017 season before being delisted and coming back and playing in the Eastern Football League in Melbourne. Xavier has mainly been recruited as a running defender but he has many strings to his bow and is capable of moving into the midfield as well. A good kick and mark for his size, Xavier will give the Power plenty of options over the next few years as he develops his game. He likes to run and carry the ball as well. All the hard work over the years, the travelling to training, playing games all over the State and carnivals, has paid off. Xavier certainly could not have done it without the support of his family to whom he is very grateful. Dean told The Mirror on Monday that Xavier is stoked to be picked up by Port Adelaide and they are all glad that the draft is finally over as it has been looming all year.